Urology Division, Department of Surgery, College of Medicine & Health Sciences, Sultan Qaboos University, P.O. Box 35, Al-Khoud 123, Sultanate of Oman. *Address correspondence and reprints request to: Mohammed S. Al-Marhoon, Urology Division, Department of Surgery, College of Medicine & Health Sciences, Sultan Qaboos University, P.O. Box 35, Al-Khoud 123, Sultanate of Oman. Al-Marhoon MS, Venkiteswaran KP, Shareef OW. Urolithiasis in an Adult with Primary Obstructive Megaureter: A Case Report. Oman Med J 2013 Sept; 28(5):357-359. This is a rare case of adult primary obstructive megaureter complicated by combined uric acid-oxalate lithiasis of the ureter and renal stones. A 24-year-old male patient presented with frank hematuria on exercise of 4 years duration. The patient had an open surgery in the form of excision of stenotic segment of ureter and left ureteric re-implantation with removal of ureteric and renal stones. Congenital megaureter is a diagnosis that urologists and radiologists need to consider in the setting of isolated distal ureteral dilation, as the diagnosis of adult megaureter may require more involved surgical measures to prevent recurrence of adverse symptoms. Keywords: Urolithiasis; Megaureter; Obstructive; Primary; Adult. Figure 1: KUB showing multiple stones in the left kidney and lower left ureter. Figure 2: IVU showing multiple stones in the dilated left ureter. Figure 3: CT scan of abdomen showing multiple stones in the left kidney and lower left ureter. 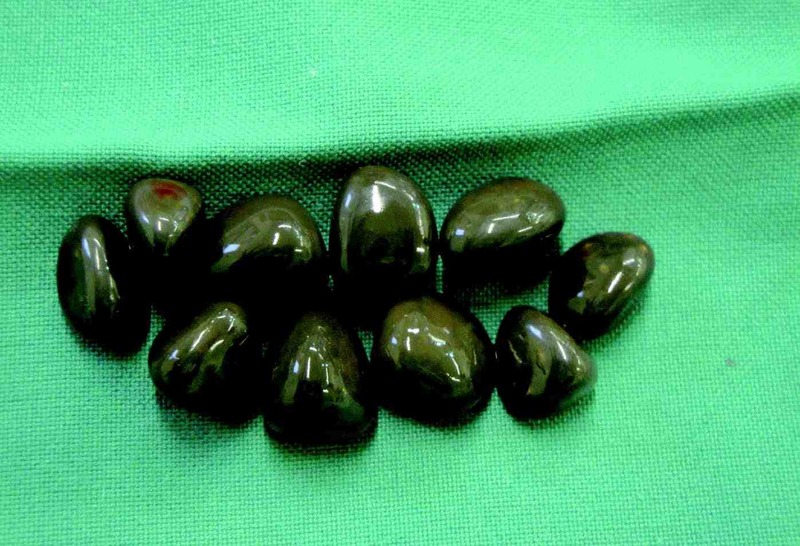 The largest stone measured 1.5 cm. In addition, there were multiple renal calculi noted in the superior and inferior calyces of the left kidney. The right kidney, however, was normal in size, shape, and contour with no evidence of hydroureter, hydronephrosis or vesical stones. Renogram scintigraphy (Tc-99m MAG-3 dose 268 MBq) showed a baseline right kidney with good perfusion, uptake, and delayed excretion, as well as a relative function of 50%. The left kidney was enlarged and showed reduction in perfusion and uptake, no excretion, dilated calyces and dilated ureter with a relative function of 50%. Post-Lasix, there was poor washout of radiotracer from the left kidney suggestive of obstruction, whereas the right kidney had good function with no obstruction. The preserved function of the left kidney could be explained by diagnosing the patient at a stage before atrophy and reduction of renal parenchyma has occurred. Stone analysis revealed combined uric acid-oxalate lithiasis with predominant uric acid structure (60% anhydrous uric acid, 40% monohydrate calcium oxalate). 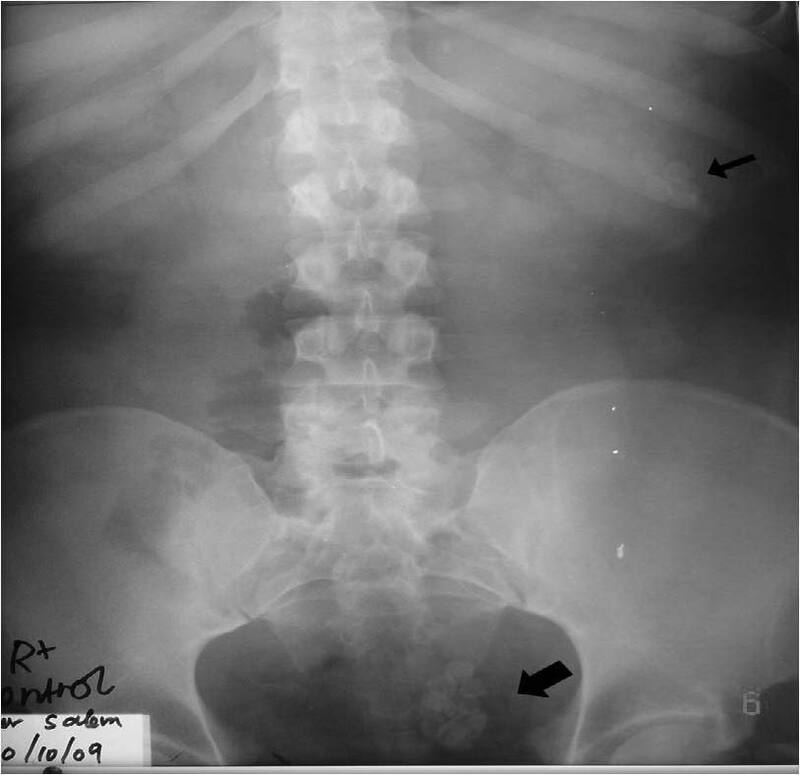 On follow-up, the patient had ESWL (extracorporeal shock wave lithotripsy) for the residual left lower calyx kidney stone which was partially fragmented and the DJ (double-J) stents were subsequently removed. A 6-month post surgery renogram revealed the right kidney to have good function with no obstruction and relative function of 59%. The left kidney had moderately poor function with partial obstruction and relative function of 42%. The patient was scheduled more ESWL sessions for the remaining left lower calyx renal stone and follow-up with renogram. His renal function remained normal on follow-up and was free of infection. 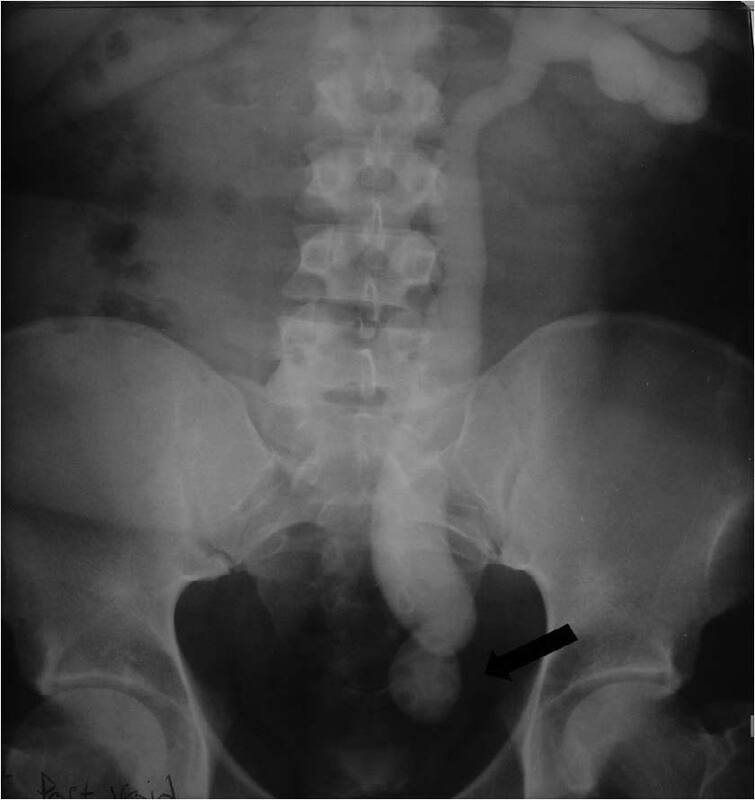 Figure 4: Retrograde pyelography showing a stenotic segment (black arrow) of the left lower ureter above which is a dilated ureter packed with stones. 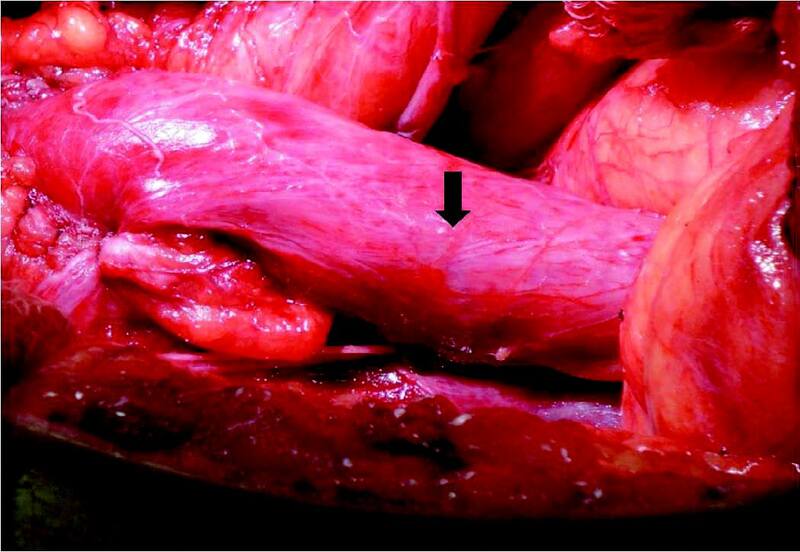 Figure 5: Intraoperative picture showing the hugely dilated ureter (black arrow) resembling a bowel segment. Structurally, normal ureteral diameter is rarely greater than 5 mm and ureters wider than 7 to 8 mm can all be considered megaureters. The current belief is that primary obstructive megaureter presents primarily in adults when the congenital abnormality does not cause symptoms or illness and is not seen by imaging study performed during childhood. Spontaneous regression fails to occur, yet patients remain asymptomatic through childhood and into their adult years. Eventual symptoms that may occur include urinary tract infections, renal parenchymal damage and recurrent stone formation. In the largest reported series of 55 adults and adolescents with symptomatic primary obstructive megaureter, Hemal and colleagues identified 20 patients (36%) as having urinary tract calculi.5 Most of the calculi were located in the ureter; only 3 (5%) of the 55 patients had renal calculi without calcification near the location of the underlying abnormality (distal ureter). 1. Hanna MK, Jeffs RD. Primary obstructive megaureter in children. Urology 1975 Oct;6(4):419-427. 2. Gosling JA, Dixon JS. Functional obstruction of the ureter and renal pelvis. A histological and electron microscopic study. Br J Urol 1978 May;50(3):145-152. 3. Khoury A, Bagli DJ. Reflux and Megaureter. In: Wein AJ, Kavoussi LR, Novick AC, Partin AW, Peters CA, editors. Campbell-Walsh Urology, 9th ed. Philadelphia: Elsevier Inc; 2007. pp. 3467-81. 4. Dorairajan LN, Hemal AK, Gupta NP, Wadhwa SN. Primary obstructive megaureter in adults: need for an aggressive management strategy. Int Urol Nephrol 1999;31(5):633-641. 5. Hemal AK, Ansari MS, Doddamani D, Gupta NP. Symptomatic and complicated adult and adolescent primary obstructive megaureter–indications for surgery: analysis, outcome, and follow-up. Urology 2003 Apr;61(4):703-707, discussion 707. 6. Delakas D, Daskalopoulos G, Karyotis I, Metaxari M, Cranidis A. 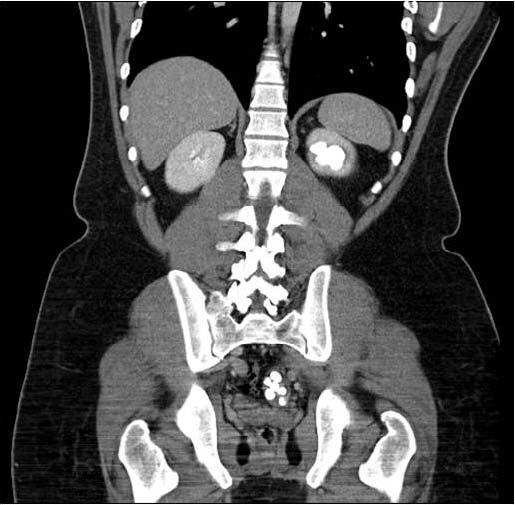 Giant ureteral stone in association with primary megaureter presenting as an acute abdomen. Eur J Radiol 2002 Feb;41(2):170-172. 7. Saurabh G, Lahoti BK, Geetika P. Giant megaureter presenting as cystic abdominal mass. Saudi J Kidney Dis Transpl 2010 Jan;21(1):160-162. 8. Wood BP, Ben-Ami T, Teele RL, Rabinowitz R. Ureterovesical obstruction and megaloureter: diagnosis by real-time US. Radiology 1985 Jul;156(1):79-81. 9. Chung SD, Sun HD, Yang DK, Liao CH. Primary obstructive megaureter with ruptured kidney. Am J Emerg Med 2009 Jan;27(1):e5-e6. 10. Hemal AK, Nayyar R, Rao R. Robotic repair of primary symptomatic obstructive megaureter with intracorporeal or extracorporeal ureteric tapering and ureteroneocystostomy. J Endourol 2009 Dec;23(12):2041-2046.